Detached holiday home on a fantastic location, just outside of Beauville in the hilly French countryside. The interior is very well maintained and rustic. The thick stone walls make sure that it stays nice and cool in the summer and the original sink and beamed ceilings bring back bygone days. The former hayloft of the annex has been converted to a recreation room with table tennis and a gym area. The old feeding-troughs now serve as a childrens beds! The children can romp around in the sloping garden (2000m²) or play a game of jeu de boules while you watch with a \"vin\" in your hand from the terrace with BBQ . For a refreshing swim, the private swimming pool offers the solution! 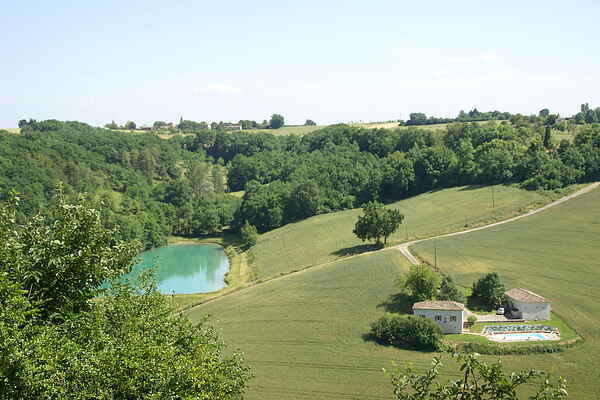 In the surroundings of Beauville (7 km) you will find several lakes where you can swim and canoe. The village has a tennis court, bakery and restaurant. Visit the medieval towns Monflanquin (40 km) with its bastide and Penne-d'Agenais (25 km). In the old city of Agen (25 km) there's also lots to explore. Through the Pont-Canal you reach the inner city with its cosy city centre with shopping possibilities and also the Musée des Beaux Arts. Here you also find a large supermarket, a golf course and Walibi amusement park.